Welcome to the North County Surf Portal page on SurfShot! Here you will find maps, reports, tides, wind and swell information. North County surf photos, videos, news and everything about North County. Create your free account and start posting and sharing North County surfing content. It is as easy as posting to your Facebook wall. If you have a surf related business around North County and would like to have your business listed or you would like to post North County surf related content like surf news or surf events, contact us to learn more about how you can participate and help us make SurfShot the best source for North County surfing content. 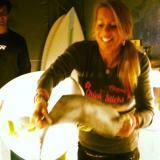 Chick Sticks Founder Lola Jade is Learning to Shape Surfboards. And her Mentor is…??? Your trusted Local Surf Shop Encinitas Surfboards is offering Chick Sticks Girls Surfboards!! THIS WEEKEND!! The Biggest Surfboard Show in San Diego Sat 10/6 and Sun 10/7 Heres the Deets are you Going?!! Chick Sticks will be there…. Two legends who have a long history of fellowship in the community collaborate for a worthy cause.